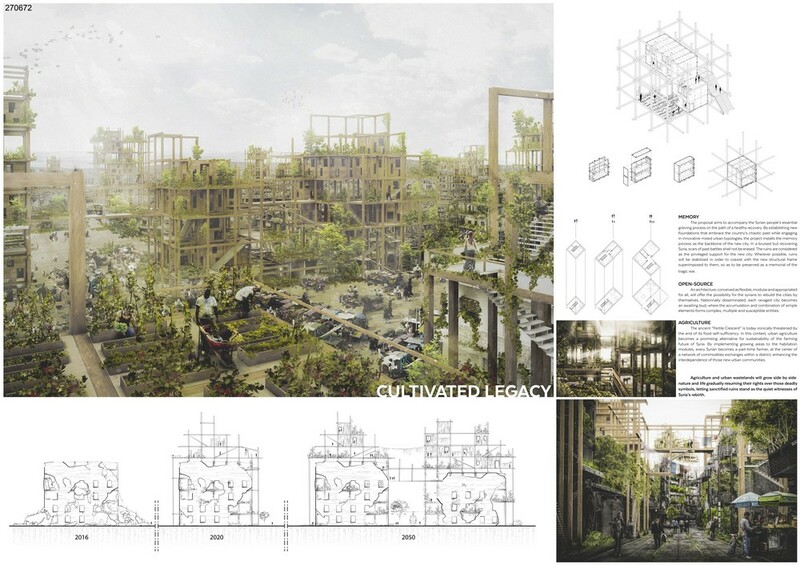 matterbetter initiated ‘Syria: Post-War Housing Competition’ for architectural students and professionals. 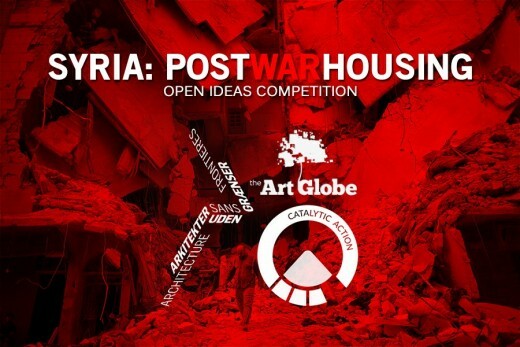 Competition participants were asked to propose a solution for housing scarcity crisis, which will affect the country as more and more cities of the war-torn country will be freed and refugees will start to come back. 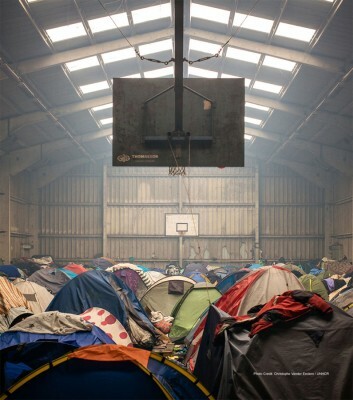 Living conditions in the current refugee camps and temporary buildings across Europe and other countries are mostly inhuman, making refugees feel desperate, since there’s also nowhere to come back as the Syrian towns are in ruins, offering nothing to people who once lived there. 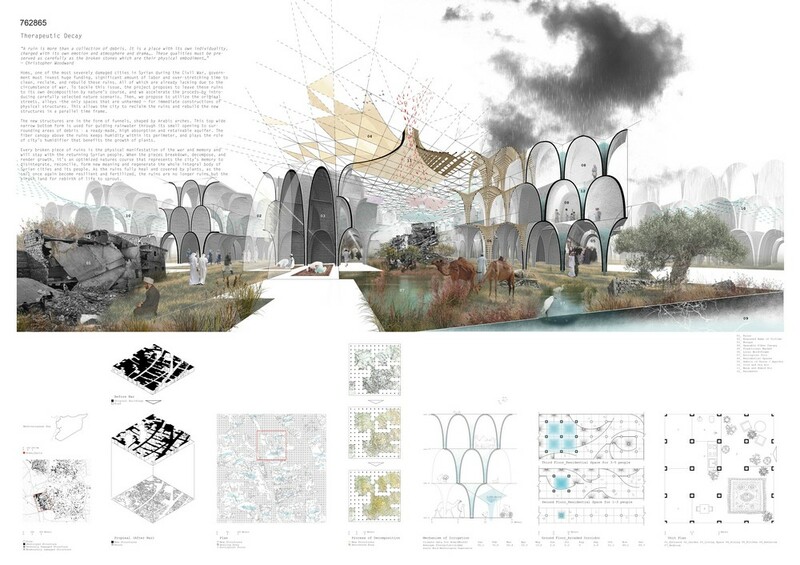 Endless Future project represents the will of coming back to a peaceful life and of repossessing of a territory. 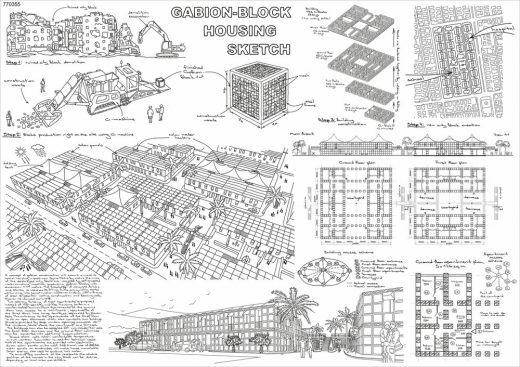 Future because it’s yet to come and yet to be built, Endless because its flexibility allows rearing it in different aspects, shapes and dimensions. 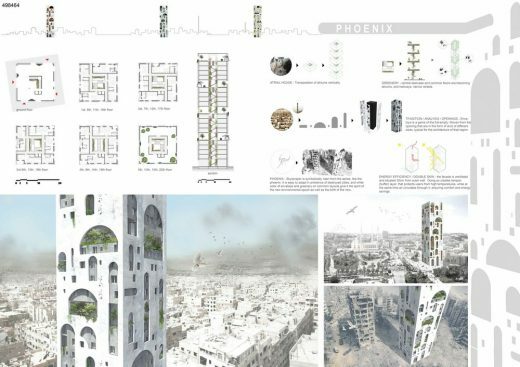 The project is thought to re-create the destroyed residential urban pattern, foreshadowing the people in the post-war Syria would go back living the cities, just where they used at the dawn of the revolution, in the same streets that guard their most precious memories. 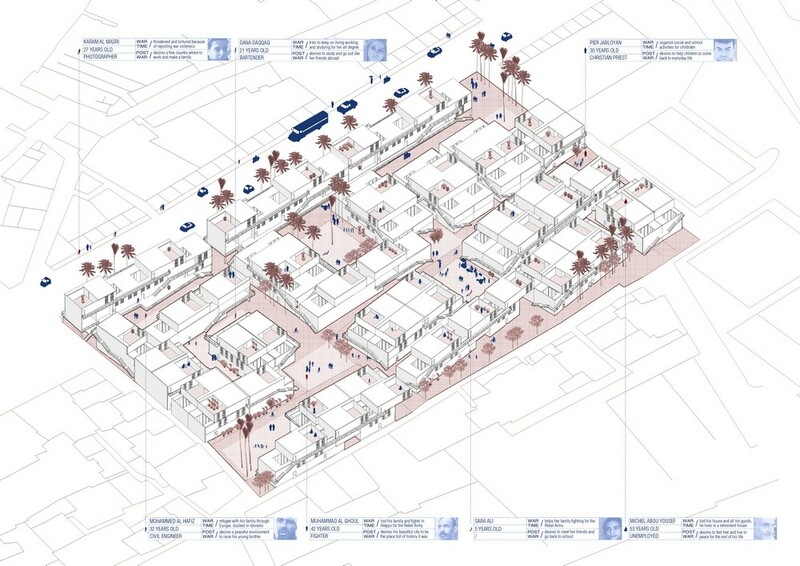 The dwellings are able to fit different financial abilities, in order to allow low-income families to live close to the center and guarantee cohabitation between high-class and poor class, as it was in the old Islamic city. 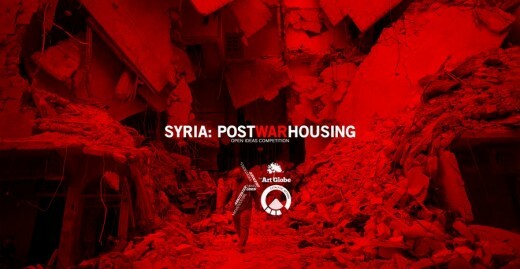 In the same way they offer shelter to untraditional family units, which may consist of a single person who lost family, or of people who lost their loved ones and form a new family group, or big families with 3/4 children as is very often in Syria. 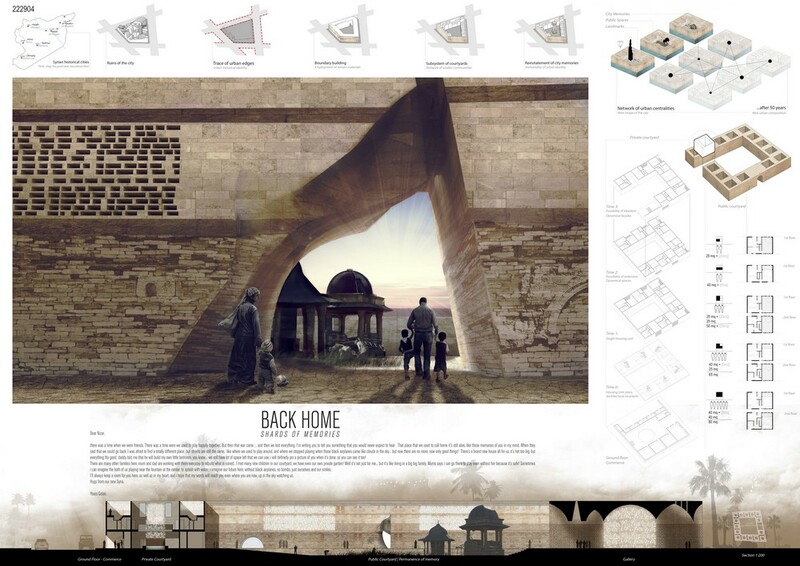 The case study chosen is the city of Aleppo, the biggest city in Syria and one of the most precious cities in the Islamic world due to its historical sites which have been hardly damaged in these years of civil war. 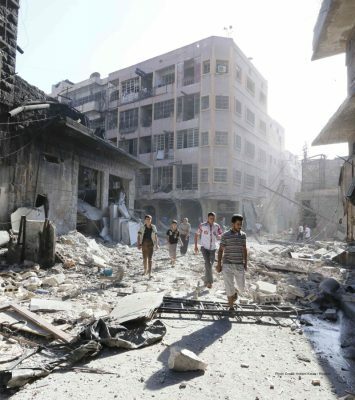 Aleppo is the exemplum of the urban development occurred in many Islamic cities during the XXth century when straight road axes were imposed on the organic historical fabric which was partly destroyed. These two warring urban form are different in terms of scale, form, accessibility and activities creating threatening tensions in the everyday running of the city. 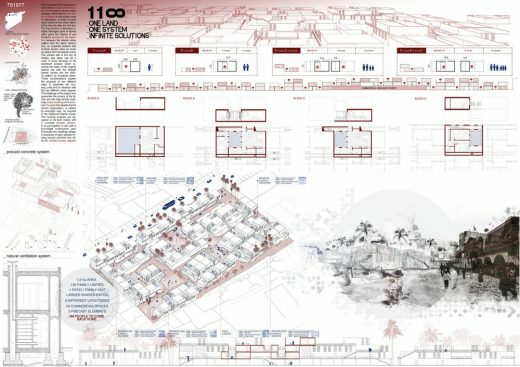 The re-built city design, therefore, can’t miss the chance of finding a solution to the transitions between the two dimensions of living. 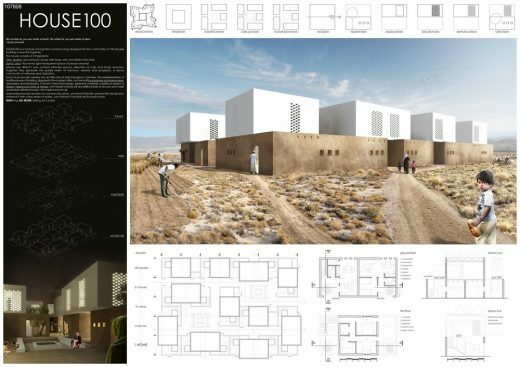 The testing site stands in the area that was rounded by the ancient walls and delimited at the south by the straight boulevard of Al Mutannabi St. that interrupts the old organic pattern. The project foresees a first configuration of the house units put together in 2/3 stories blocks facing the old city, and a second one with 4 stories and a ground commercial level facing the main street. The house unit is the result of different combinations of 4 living modules, providing different dimensions according to the various family units. The leading principle is to provide every house with a patio that becomes not only the open space where take place family activities, but also the core all the house develops around, dividing different functions according to Islamic family routine. The design assures privacy to the patio even with a multiple storey disposition and can be resumed as the combination of an entrance filter space that separate the living area that is also the male part, and the sleeping area that is the female one. All the types of dwellings can be built with 5 differently dimensioned concrete precast elements, 3 wall panels, 1 floor slab and 1 stair slab. The precast construction system fits with the economic and industrial difficulties of a post-war country and is available to small worker teams and low-budget construction yards. 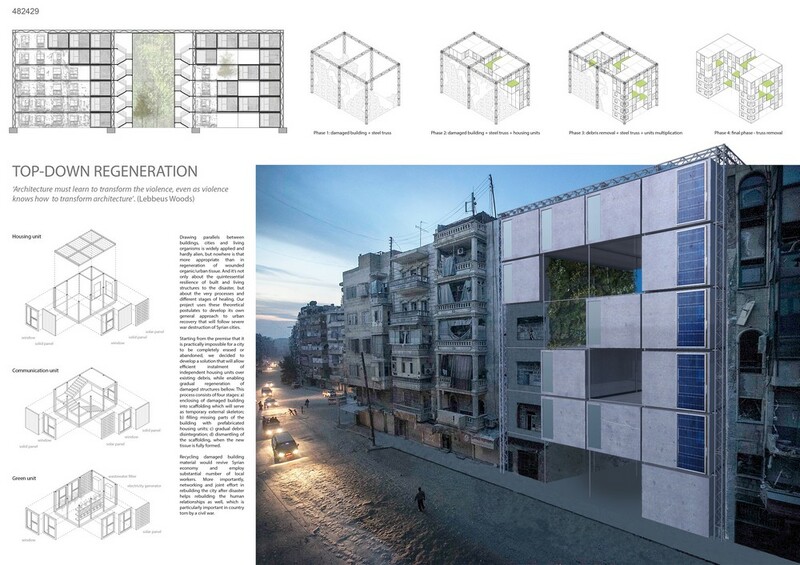 The housing blocks use a common installations well that host a vertical wind catcher tower creating a natural ventilation and cooling mechanism in every house. 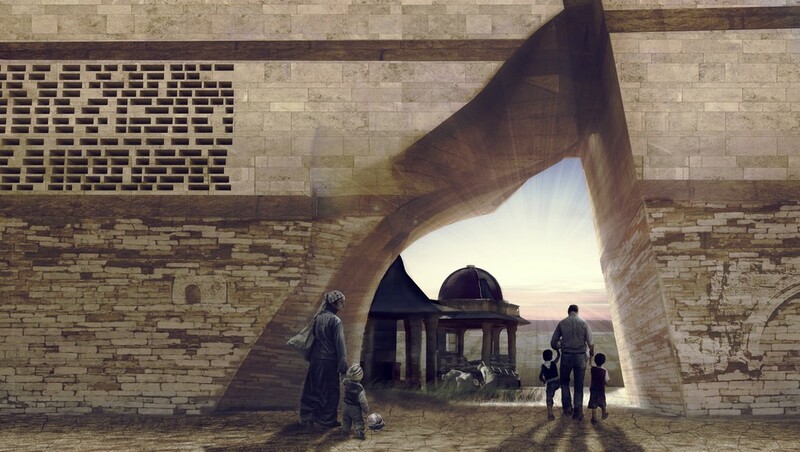 Endless Future project is thought to give a solid environment where Syrians return to feel being home and close to their traditions, where to share memories and write what sooner or later finally will be history, in order to face the hard challenges Syria will have to overcome. 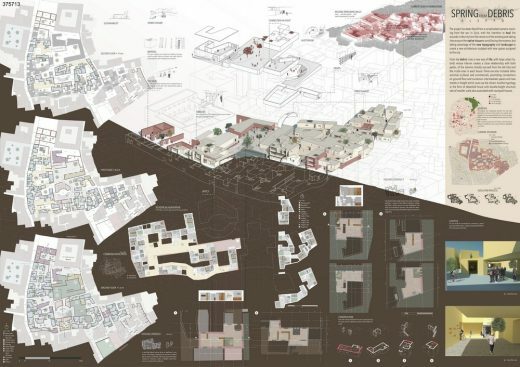 The project has been faced from a complicated scenario resulting from the war in Syria, with the intention to heal the wounds in the city from the remains of the existing and taking into account the native tissue to avoid losing the essence, but taking advantage of the new topography and landscape to create a new architecture sculpted with new spaces assigned to the city. From the debris rises a new way of life, with large urban hybrids whose interior creates a close relationship with both patios, of the volume (mostly rescued from the old city) and the inside ones in each house. There are also included other activities (cultural and commercial), promoting connections on ground floor and numerous intermediate spaces and new streets in height which cover up the citizen. 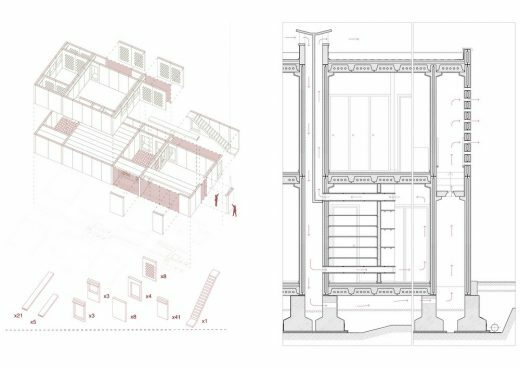 Another typology in the form of detached house with double-height structure sets of smaller scale also associated with courtyard houses. The location was strategically selected. The main idea was to fix the cities from the inside to the outside, dealing with the most damaged blocks first, and the analysis of this turned out to be related with the position of the main mosques. 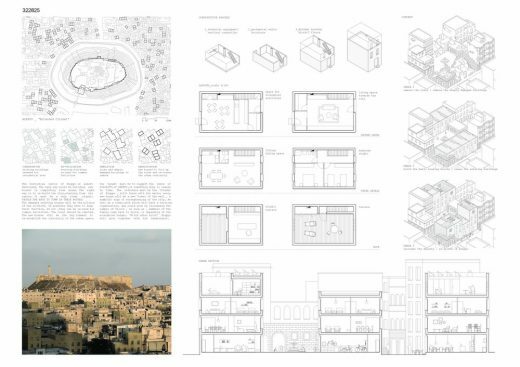 That is why the project has its context in the Old City of Aleppo and pretends to be a new architecture adaptable to all Syria. 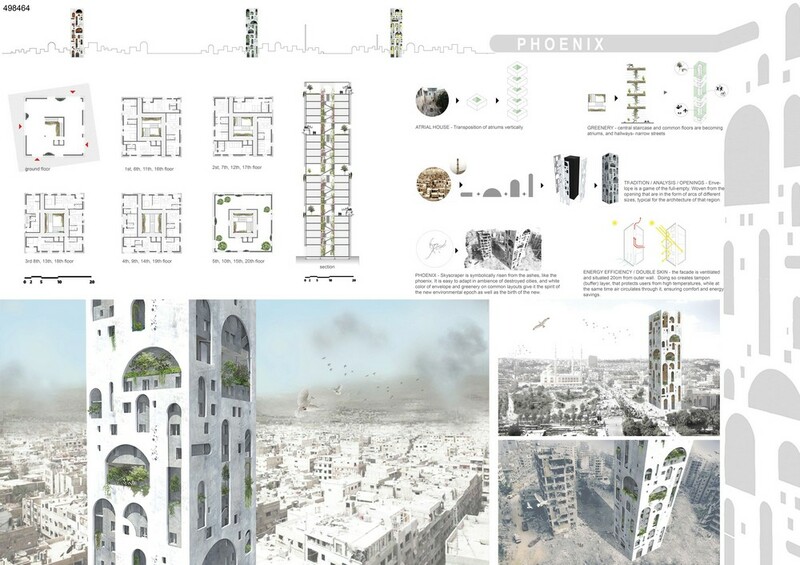 The debris concept – The healing includes the acceptance of the events of the war as part of the city history, that is the idea of keeping advantage of this material to configure the public space, as a terrain containment. The Souk – Associated to the mosque it is located in the inside of the existing walls that provide a public path around the ancient building connected to commerce. 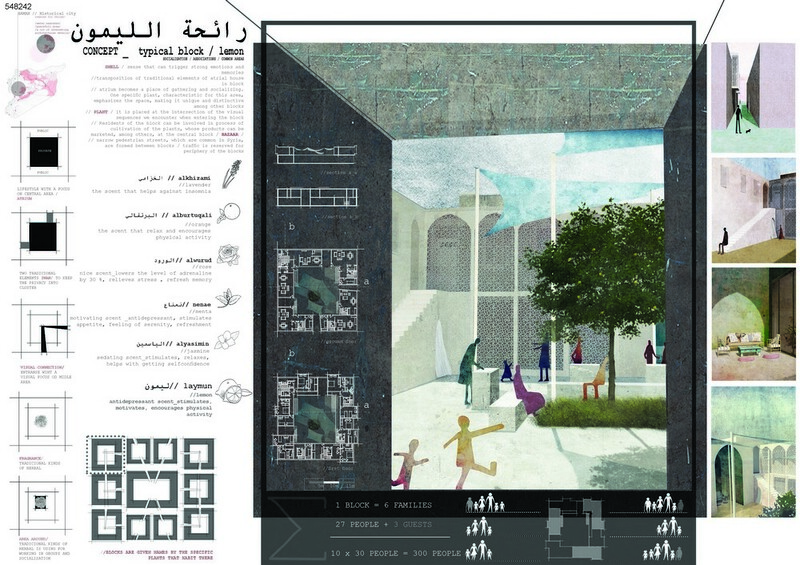 The Debris Square – It is the biggest free area of the project, in which it is respected the real height resulting of the debris in the current state, associated to public use, commerces and cafes, it connects the market and surroundings of the mosque with the Auditorium in the south of the block’s heart. 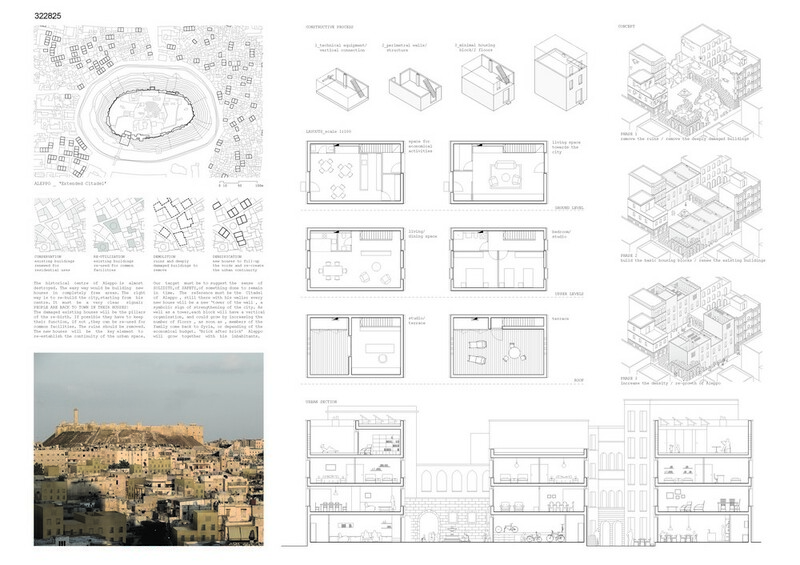 Auditorium – From the topography of a bomb in the war come of the idea of a dome sculpture in the main cultural building that solve the connection of different heights and provide at the same time a temporary scenario to the city center and a public open space. The Street Market – Following the structure of the main souk rising from the remains walls this ancient dwelling helps as a smaller temporary local market. 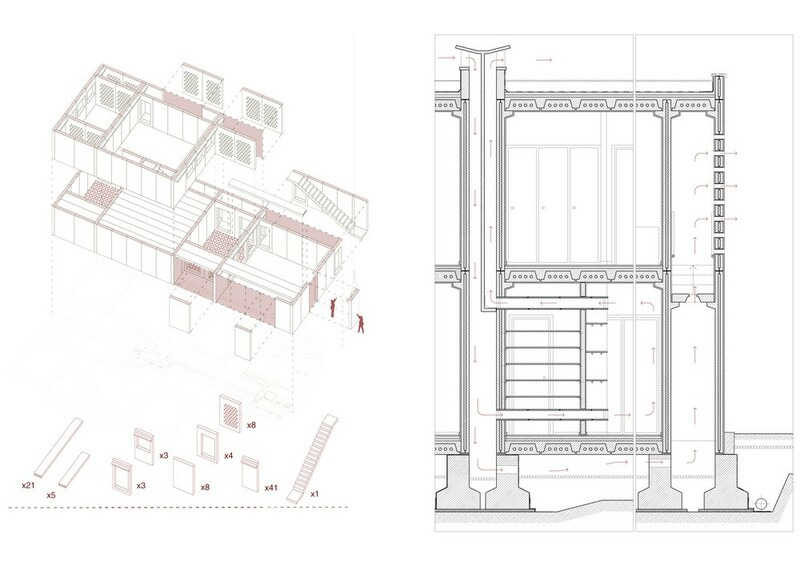 Typology I – In each big hybrid volume there are dwellings in one storey. 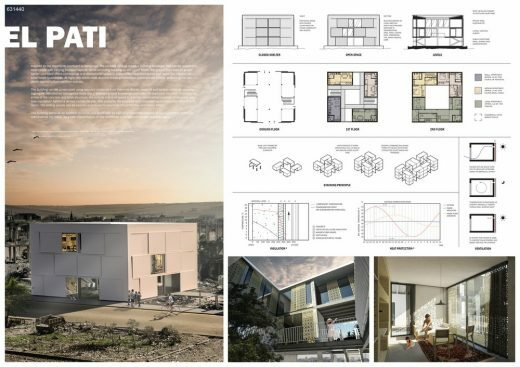 The strategy is repeated, the entrance is indirect due to privacy, the kitchen and living space with higher ceilings are related to a patio or skylight and the bedrooms are organized by cupboards. Tyology II – The double-height single houses have some similarities with type I, because of the different heights of ceiling, that helps to define spaces and solve installations. The stairs associated to entrance and connect the downstairs service area (day life) with the upstairs served one (night life). Construction – New walls would complement the ruins already existing. The stairs and the cupboards would be the flexible elements. The main materials are concrete as a dwelling structure, wood for public lattices associated to light and public transit); debris and corten steel for containing walls and underground connection. Our proposal works with the idea to retrace shape of urban’s lot that were destroyed from war, in order to conserve the morphology and city’s identity. 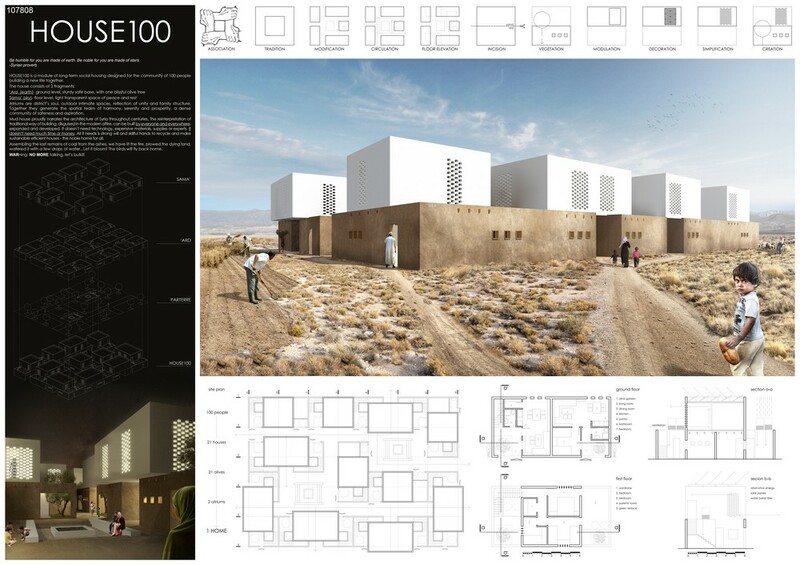 New buildings are assembled parlty with ruins, partly with new materials and they play the role of traditional syrian house organized around a courtyard. 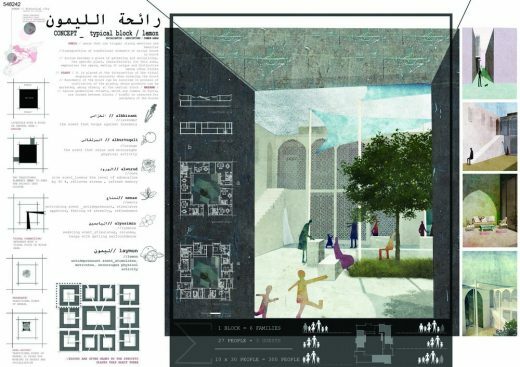 The idea is to realize two different type of courts: the shape of the urban lot is sorrounded with small and private courts, this system composes a single larger public courtyard which can accommodate different functions such as public or historical buildings, public gardens, mosques or attraction poles. A wider urban network connects all these public spaces resulting in a new city’s identity and idea. Every building has a ground floor with commercial and public spaces in order to have a direct relationship with the courtyard; housing is developed on the higher floors. Single residential units are flexible houses with 25 mq of immediate living rooms and 20 to 50 mq of potential a dynamical space, that allows the owner to change the unit configuration in relation with his needs. 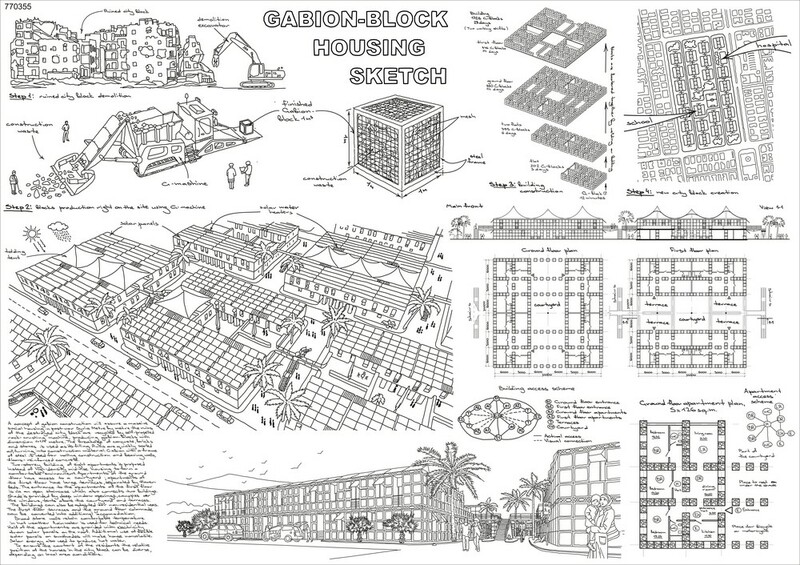 n the beginning every smaller couryard block will have services like kitchen, dining room and living spaces in common. With the passing of time these spaces will accomodate new different public functions or will become new houses for other families . The purpose is to establish a wide community to help each others to rebuild a new urban block, a new city and at last a new Sirya.